Live life as a true beach bum, relaxing in the warm rays of the sun and sweeping the golden sands to uncover the treasure that lies beneath. Click here to play! It won't be long before your metal detector is picking up a few big wins! You might be surprised by all of the valuables hidden deep in the sand as you scour this beach, including antique guns, jewels, expensive watches and gem-encrusted goblets. Spin two to five of any of these symbols and you'll get a pretty decent payout. Though you should be aware that there might be some bigger prizes buried in this sand. Spin two to five treasure chests filled with gold and you'll get up to 2000 times your line bet. You might even pick up golden coins or diamond rings. Two to five of either of these will get you up to 1000 times your line bet. You're bound to uncover a few surprises while searching the sands, including the treasure map, which acts as a scatter. But, always be aware of your competition � the Detector Dude. Spin three or more of this guy to trigger a bonus round. 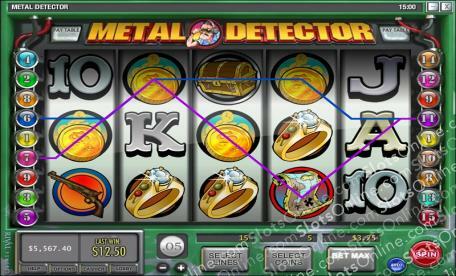 Run your detector over these reels and you're sure to discover plenty of big slot wins! The treasure map acts as a scatter. Spin three or more of this symbol anywhere on the board and you will trigger a free spin with a multiplier that will see you winning plenty of cash. The Dector Dude acts as a bonus symbol. If you spin three or more of these guys anywhere on the board and you will trigger a bonus game. During this game you will have to walk along the beach with your dectector to find burried treasure. Walk along until your detector beeps wildly, then dig to reveal your prize!